What’s the secret behind the Art of Hospitality? Ferrari Trento decided to put the question to some of the biggest stars of the international restaurant business, turning the subject into the main topic of a debate organized at Palazzo Serbelloni, in Milan, where it was at the focus of an intense discussion on the role that service, setting, and hospitality play in food and wine experience. It was indeed the strong belief in the importance of these elements that brought the company established in Trentino to forge a partnership with “The World's 50 Best Restaurants” and create “The Ferrari Trento Art of Hospitality Award”, which will be awarded on June 13 in New York during a much anticipated night that will see the presentation of the best restaurants in the world according to this prestigious ranking. 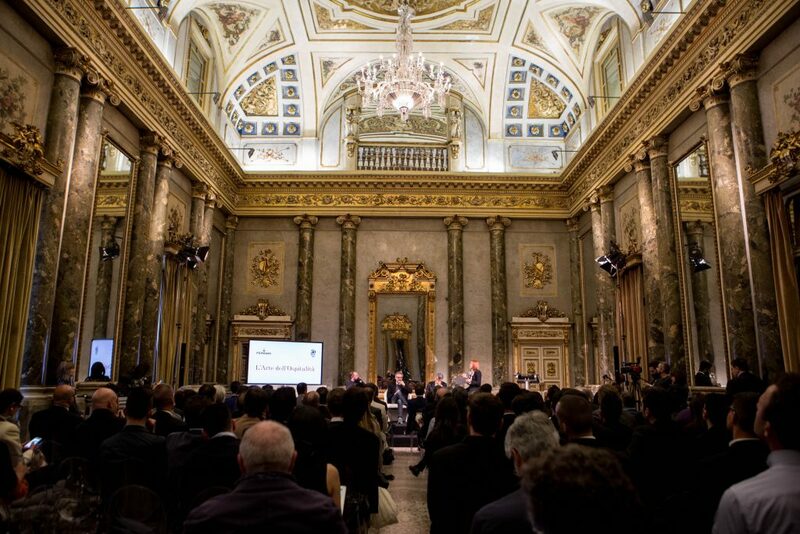 Whilst waiting for the name of the restaurant that will be awarded the best at turning its service into an unforgettable experience, here are some of the highlights of the meeting that took place in Milan. Art of hospitality means giving to our guests an experience that fully embraces all senses and leaves a lasting memory. Working with joy to welcome them with a genuine smile, being able to face responsibilities that go beyond those defined by our role, being honest and willing to improve, treating guests, colleagues, and environment with respect, and finally cherishing a strong team spirit: these are the main ingredients of the hospitality recipe. Andreas Caminada, Chef of Schloss Schauenstein, Switzerland. At The Clove Club, we always encourage our staff to be themselves, tearing down the typical formal concepts related to the restaurant business that often create a barrier with the guest. It is of paramount importance to understand who stands in front of you and behave accordingly, read the body language, open a dialogue with a smile and simple questions, but also respect and leave the space of privacy provided by the table. The Art of Hospitality relates to several elements: character, flexibility, passion, friendship, and teamwork. Daniel Willis, General Manager of The Clove Club, London. The key element providing harmony and excellence to a dining room is the ability to know the individual skills of each member of the staff and be able to adapt them to the tasks at hand, allowing all of them to express at best themselves, always respecting the limits of the rules required by their role. Raffaele Alaimo, CEO of Alajmo Group. The Restaurant is the place where you feed and, in some way, restore souls. The kitchen plays a crucial role but it does not have the upper hand on the service, which isn’t only represented by the service at the table, but starts earlier, when the table booking is made. We offer dreams, but the real secret to do it is – as Bob Dylan put it – to “get up in the morning and get to bed at night, and in between do what you want to do”. Massimo Bottura, Chef at Osteria Francescana, Modena. Without passion, you cannot give 100% and always work like your business were at stake, which is the real secret of this profession: if you live hospitality in such a way, it becomes an extraordinary work that allows for personal enrichment and involvement, offering always new challenges. Mauro Governato, Manager of Hotel Four Season, Milan. The experience quality depends on several factors, such as the correlation between value, cost and quality, the active involvement in the experience, the balance between technological aspects (which are useful for providing “special effects”) and human aspects (such as passion and sentiment) – what nowadays is called high-tech/high-touch – the broader vision, and finally a pleasant and spellbinding location, where lights, interior design, temperature, scents and music must be studied in detail. Severino Salvemini, Tenured professor at Bocconi University. Today, the chef plays a strong communication role, but 60% of the food and wine experience in the restaurant is made in the dining room, therefore I dare to say that “young people should stop dreaming about becoming chefs and start working as waiters!” Gualtiero Marchesi, who is considered the founder of the “new Italian cuisine”.